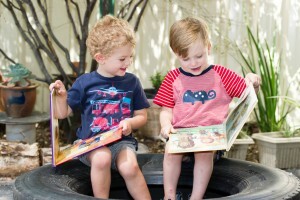 Our learning programs are play-based and tailored to each child’s individual strengths, interests and needs. Play is at the heart of all of our learning programs. Play promotes self-motivation, self-direction and self-confidence. Play helps to develop cooperation, team work and social skills. Play encourages curiosity, persistence and concentration; and builds language and numeracy. We offer flexible indoor and outdoor play spaces where your child will learn, create and succeed in the environment of their choice. We are firm believers that all weather is good weather for outdoor exploration, which means your child will have access to outdoor learning throughout the year. We have a dedicated Outdoor Educator, who plans and implements specialised outdoor programs that support and extend on the learning that your child will be engaged in indoors. Our outdoor learning extends beyond the perimeter of our services, your child will get out into the community and explore their local surrounds. Visiting the local library, shops, tram and bus rides, and so much more. We invite members of our local community to our services to share their skills and knowledge the children. Visitors range from local police officers and paramedics who share information to keep children safe, to family members who bake or play music with the children. We are proud of our involvement in the Small Green Steps Program which has supported us in becoming a sustainable organisation. As part of the program, each of our services have their own garden, veggie patch, worm farm and recycling program. Our Brunswick service is conveniently located next to the Moonee Ponds Creek. Your child will explore the local reserves, create their own play spaces, investigate and problem solve as they walk, run, jump and climb their way through the natural environment. ELLA (Early Learning Languages Australia) is a fun, digital, play-based program designed specifically for kindergarten children. We have a strong partnership with Milparinka Disability Services that allow for a differently abled young person and their carer to visit us each week to read stories, play and share meals. Our intergenerational play program encourages positive interactions between our children and senior members of our local community. Children will play, share stories, craft, garden and more. We explore Science, Technology, Engineering, Art and Mathematics through fun, play-based activities. Your child will be encouraged to be an active problem solver, challenged to expand their knowledge and skills, and given endless opportunities for ‘light bulb’ moments that provide a strong foundation for life-long learning. We offer 3 year old and 4 year old kindergarten programs, run by a qualified kindergarten teacher. Your child can access our kindergarten programs 5 days per week, and will be engaged in open-ended and structured activities that will build on their school readiness. Learn more about our 3 year old kindergarten program here and our 4 year old kindergarten program here.